Wouldn’t it be great if a handful of nuts could prevent atrial fibrillation? In this article, I’ll review the atrial fibrillation nut studies and share what I have learned from treating tens of thousands of atrial fibrillation patients over the last 23 years. If you are a nut lover, like me, then you’ll love this most recent study. In this Swedish atrial fibrillation nut study, researchers followed 61,364 people for 17 years. After reviewing all of the data, they concluded that eating nuts decrease the risk of atrial fibrillation by 18%. In order to get this 18% reduction in atrial fibrillation, the Swedes in this study had to eat nuts at least three times weekly for 17 years. Sadly, they didn’t ask what kind of nuts they ate. Thus, we have no idea if one nut is better than another for treating atrial fibrillation. The most interesting part of this study was that the more nuts people ate, the less atrial fibrillation they had. Unfortunately, the researchers only analyzed the data out to eating nuts three times weekly. Based on the direction the graph was going, I suspect that daily nut eaters probably enjoyed even more atrial fibrillation protection. While researchers did their best to make sense of the data, we can’t know for sure whether it was the nuts or the healthy habits of nut eaters that provided this protection. To better understand whether nuts prevent atrial fibrillation, we need to look to other studies. In addition to the Swedish atrial fibrillation nut study, there have been two other significant studies looking at nut eaters and atrial fibrillation. One of these studies showed that in male U.S. physicians, nuts offered no protection against atrial fibrillation. The other study showed that while nuts, as part of an ancestral Mediterranean diet were helpful, they didn’t specifically prevent atrial fibrillation when compared to olive oil. I want to believe the Swedish atrial fibrillation nut study. It only makes sense that nuts prevent atrial fibrillation. Below are four reasons why it is possible that nuts prevent atrial fibrillation. Having optimal magnesium and potassium levels may be protective against atrial fibrillation. As nuts are high in electrolytes, they could offer some protection. Also, all of the other vitamins and micronutrients of nuts make a compelling argument as to why they might help. Despite all of the fat in nuts, studies show that these healthy fats help you to lose weight. And as weight is so tightly linked to the risk of atrial fibrillation, it only makes sense that anything you can do to keep your weight in check would also help keep atrial fibrillation away. Our studies, as well as those from many other people, have shown that the higher your levels of inflammation, the greater your risk of atrial fibrillation. As nuts help to reduce inflammation, you would expect that this would help your heart to stay in rhythm. Depending on which study you look at, nuts have been shown to be protective against almost every form of cardiovascular disease. Thus, given the incredible track record of nuts, you would expect that the same would be true for atrial fibrillation. I wish I could tell you that all I have to do is prescribe a handful of almonds and atrial fibrillation goes away. If the most potent antiarrhythmic drugs only have a fifty-fifty chance of keeping people in rhythm for even just a year, we can’t have too high of an expectation for any nut. What I can tell you is that I have seen hundreds and hundreds of patients put their atrial fibrillation into remission with healthy living and weight loss. And as part of this healthy living and weight loss, the vast majority of these patients ate nuts every day. Nuts fill you up and help with insulin sensitivity. While most liked almonds, peanuts, walnuts, and other nuts were also popular. When it comes to using food as medicine, it is hard to isolate the beneficial effects of any one given food. Instead, it is the cumulative effect of nuts, seeds, vegetables, berries, etc. Before my health turn around six years ago, I almost never ate nuts. Since that time, I eat nuts every day. It is part of my daily breakfast. In addition to vegetables and berries, I eat various nut butters on Ezekiel (a flourless bread). Instead of jam, I sprinkle lots of chia seeds and flax seeds on top of the nut butters for a crunchy texture. As with my atrial fibrillation patients, I can’t say that nuts put my autoimmune disease, eosinophilic esophagitis, high blood pressure, or high cholesterol into remission without medications but it definitely played a role. 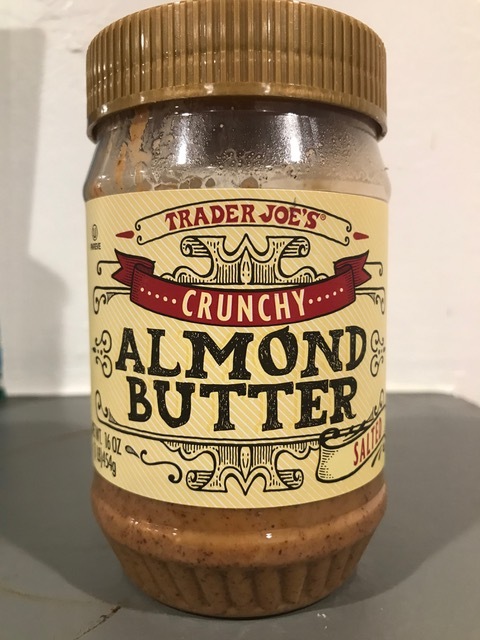 I love the taste of nut butters, and I never let a day go by without partaking. While the experts may debate whether nuts prevent atrial fibrillation, in my mind, I see no significant downside for most people (unless you have a nut allergy). Even if nuts don’t help your atrial fibrillation, your body will still thank you for eating this superfood. Has optimizing your diet helped with atrial fibrillation? Please leave your thoughts and questions below. For questions, please be patient as it may take me a few weeks to get to all the questions. Is there an age limit for an ablation ? There is no age limit for ablations. Our study showed that it can be safely done in octogenarians (https://www.ncbi.nlm.nih.gov/pubmed/19889181). However, the recently finished CABANA study suggested that people over age 75 may not do as well (https://drjohnday.com/cabana-study/). Is your EoE in remission since you adopted your longevity diet? Were you ever on drugs for that? Yes, my eosinophilic esophagitis has been in remission for the last few years without meds. Previously, I was on Prilosec and steroids. You are ALL NUTS. FIRST IT’S PREVENT THEN IT’S DECREASE BY 18%. LET ME RUN THIS ONE BY DR. NATALE. IN THE MEANTIME GO FOR THE MACADAMIA NUTS. my swedish uncle used to say.,there’s nothing as sweet as a good nut. i was never sure if he meant the nutty sweet person or a good pecan or walnut. or of he was saying swede instead of sweet,. but i knew it was all good. love all nuts! from diet and lifestyle changes ,. including eating nuts daily,… i haven’t had an af episode since 11-6-2017. grateful! !